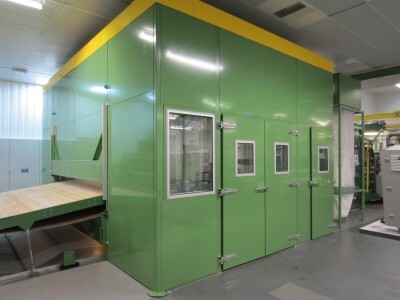 Acoustic enclosure for a Needle Loom Machine which forms part of a production line manufacturing high-specification non-woven media. To design, manufacture, deliver and install the required enclosure, sized at approximately 6.3m long x 4.4m wide x 3.6m high. The nature of the noise created by the needle loom (i.e. impulsive, low frequency) means that the noise is particularly difficult to mitigate. 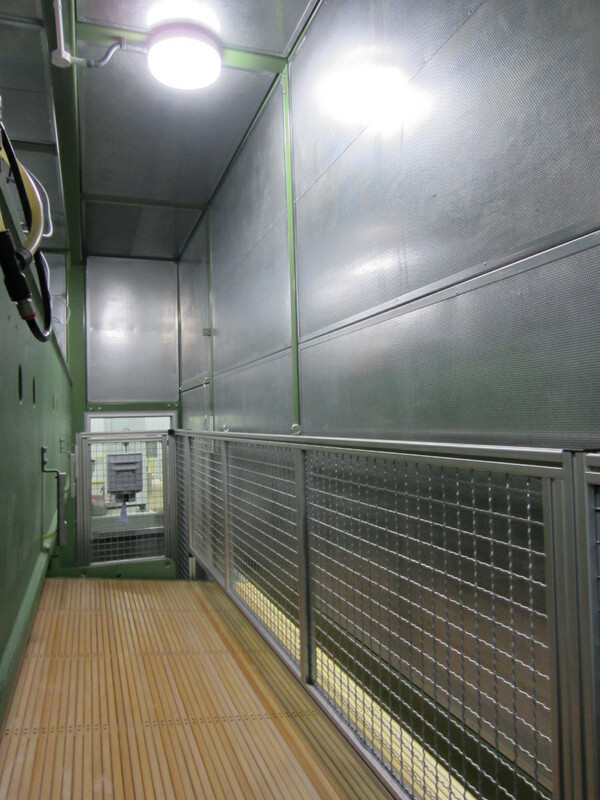 It was achieved using high mass panels with an acoustically absorptive inner surface. Incorporating three ‘material feed slots’. The upper infeed slot included a counterbalanced vertical sliding hatch enabling operators to adjust the size of the aperture to accommodate material of differing thicknesses. The lower infeed slot included a hinged hatch, supported with gas struts for ease of use, facilitating access to maintain the rollers. Central run of roof panels, panels directly above the double doors and roof level structural members to be removable without compromising the structural integrity of the enclosure, facilitating access to the needle loom motor for maintenance or replacement. 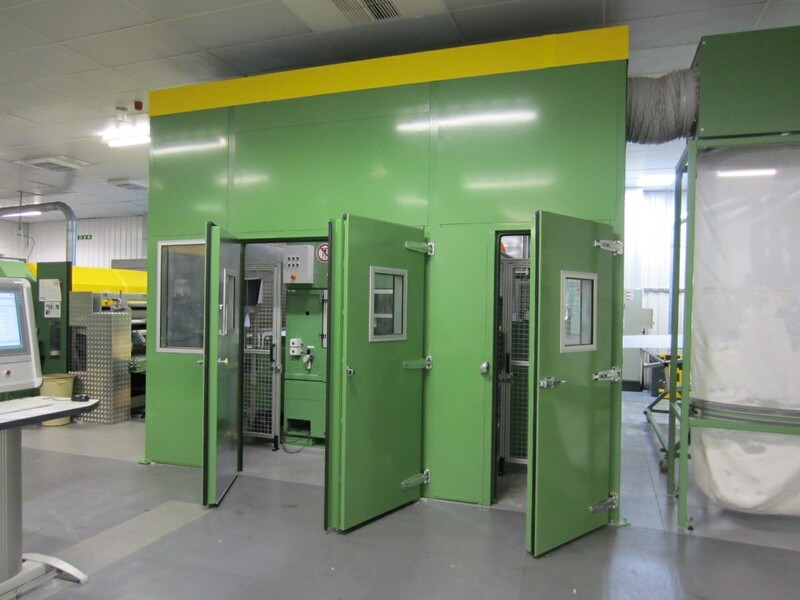 Incorporating 2-double door sets, facilitating access to the needle boards, and 1-single man access door, all double sealing with vision panels. Incorporated a number of vision panels permitting operators to monitor the production process, dual glazed with lined reveals so as not to compromise acoustic integrity of the enclosure. Sealed service apertures where required for electrical cables and ductwork that forms part of the waste extraction system. Addition of an extraction fan at roof level along with air attenuated air inlets introducing forced ventilation to maintain an acceptable temperature within the enclosure enabling the needle loom to operate without overheating. 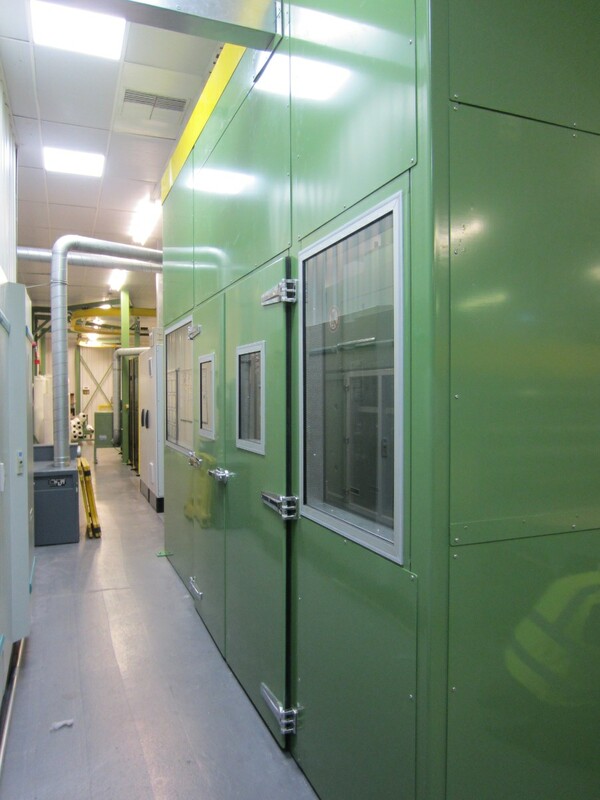 Enclosure supplied in a powder coated finish in colours to match that of the production line machinery. Despite space restrictions, Acoustic Applications team of skilled fitters installed the enclosure around the existing production line with minimal disruption to production. 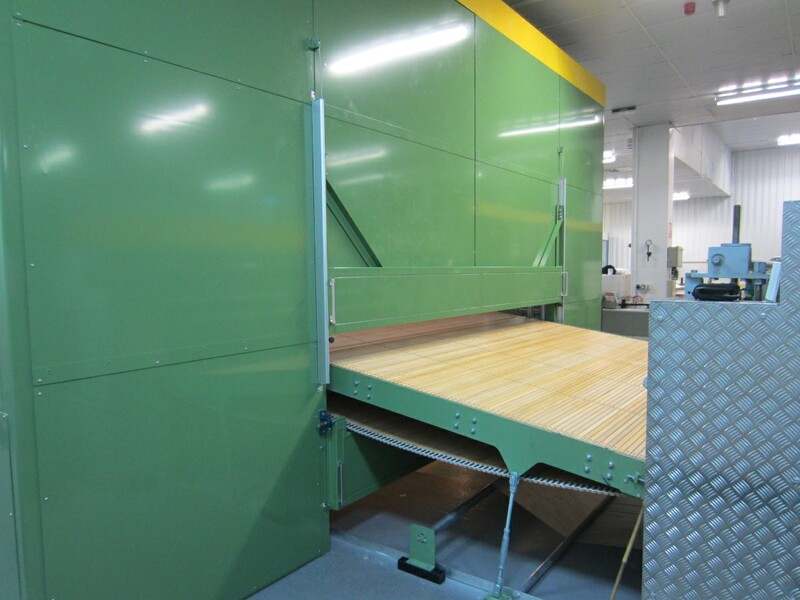 The enclosure provided a noise reduction of 30-35dB(A) in airborne noise levels, bringing factory ambient noise levels in the surrounding area to below the First Exposure Action Level (80dBA) of the Control of Noise At Work Regulations 2005.